Hello, friends! I’m writing to you from Barcelona, where we’re spending the month of August. We really look forward to exploring new places, seeing all the sites, trying new foods, and having new experiences. 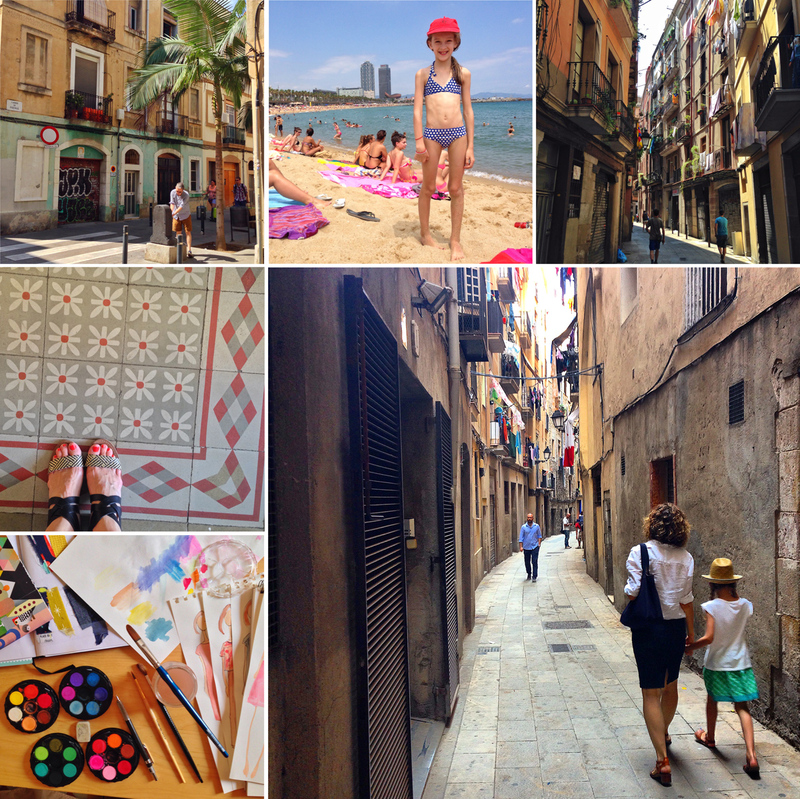 We haven’t been back to Barcelona since S was a baby, and it’s really interesting to see the city from a different perspective now that she’s a little older. Last time we were here it was difficult to take her to the beach because she tried to eat the sand (she was nine months old); now she just loves the beach. If you’d like to follow along with our adventures we’re posting lots of photos to Instagram (on both my personal account and on the Oliver + S account), so please come with us! In between adventures, I’m finishing up all the fall patterns we’ll be releasing soon. And we’re conducting two photo shoots this month, so it’s still busy, busy! But in the meantime, let’s talk about bras, shall we? I know. We all love to shop for underpinnings. I loathed and dreaded it until two years ago when I forced myself to walk into my local lingerie boutique and was fitted for a bra by a real expert. It was a life-changing experience! I’m not talking about Victoria’s Secret here–I mean a really good fitting where after your measurements are taken a specialist works with you to find the right bras for your shape, lifestyle, and preferences. I learned so much about how a bra should fit, how to adjust the straps, where the band should sit, and even how to put it on when I get dressed. Turns out, I’m wearing a completely different style and size now, and I’m so much happier with how my bras feel and how my clothes fit as a result. Believe it or not, the entire experience changed my mind about bra shopping, and now I almost look forward to adding to my small collection. I’m starting to look at bras as both a practical necessity as well as a pretty accessory that help me to feel more feminine and attractive. I’ve even purchased a few really special beautiful bras, just because it feels good to wear them. I’m sure you’ve heard other people say that it’s important to find a bra that fits well. But why? Well, a properly fitted bra makes such a difference in how your clothes fit! It can also help you to look much, much better. Saggy breasts aren’t flattering to anyone, and when your breasts are lifted into place you’ll look better. You might even look a bit slimmer, since there will be more space between your breasts and your hips, giving you more of a waist. When you’re sewing for yourself you’ll really notice that a bra puts your bust in a more flattering position for your clothing so your clothes will hang better as a result. The darts in your blouses and dresses will be better positioned, and everything will be “in place.” Does that make sense? Here are five other tips to keep in mind with regard to bras. Different bras and different brands will fit differently. It’s important to find the right bras for your body, not just the bras that are cutest. You may find that you wear a different size depending on which brand you’re buying. It’s worth taking time to try on each bra rather than just buying your size. Invest in good quality bras. They’re made from better materials that will last longer. Don’t wear the same bra two days in a row. This will help your bras last longer, since the elastic will have time to recover between wearings. My local boutique recommended starting with three or four bras so you can keep them in rotation. This helps them to last longer. Wash your bras by hand using very gentle soap. I love Soak for this purpose. Baby shampoo is gentle, too. If you don’t have a good boutique with knowledgeable salespeople in your neighborhood, you might be interested in a newish on-line company that can help you find the right bras. True & Co started in 2012, and according to an article I read recently, “has amassed 7 million data points from about 500,000 women on bras, underwear and loungewear, identifying more than 6,000 breast shapes.” You answer a few questions using their on-line quiz (I’d recommend doing this near a mirror because you need to refer to your shape for some questions) and the company uses your information as well as their collected data to determine your size. Then they suggest bras that are selected according to your answers and preferences so you can choose the ones you like best. Once you’ve made your selections you can try them on and decide at home, then keep only the bras you want to purchase. And I have to say–their prices are very good. Americans tend to be very practical in our bra choices. After all, we’re busy women! It’s nice to not have to think about one more thing when you’re getting dressed in the morning. I mean, I’d much rather put on an all-purpose bra in the morning so no matter what I wear–slim-fitting T-shirt, V-neck blouse, or semi-sheer white blouse–I don’t need to change my bra to suit my clothing choices. Initially, I started my bra “collection” with four T-shirt bras for a smooth shape. Now I’m starting to add a few more feminine styles to my wardrobe. But I’ll admit I still reach for the T-shirt bras for everyday dressing. It’s just so easy. What about you? Have you found the right bra? And have you noticed what a difference it makes in how your clothes fit? Lies – so happy to see a post about this topic. I, too, only recently discovered a bra-fitting shop in my city. Had my first proper fitting less than a year ago. The difference my new bras have made is difficult to describe. Let’s just say, after nursing 2 kids, my new bras have put a swing in my step that had been lost in a sea of stretched-out, mis-shapen under-garments. Thanks for writing about bra-fitting – its such a small, but helpful thing to do! Gracias ,es un documento muy bueno todo lo que nos indica alli es muy importante,siempre me ha interesado lo referente a este tema ,gracias nuevamente. Love this! I recently weaned my daughter and rewarded my 2 1/2 years of hard work with new bras. It was frustrating at first, but once I tried a larger cup size in exasperation, a lightbulb went on. Just like a dress size, the numbers don’t matter, it’s about what fits well and makes you feel good! I’ll be checking out that site you mentioned, thanks! There’s nothing to really disagree with here and of course a properly fitting bra is more comfortable and can make clothes hang better etc. One thing I’d add is that two different styles of bra can give drastically different shapes even if they both fit right – so for those of us sewing our own clothes it’s important to make fitting adjustments wearing the bra you plan to wear with the finished garment. But on a different note, I think we could give more consideration to the language we all use when talking/thinking about our bodies. Some of the sentences in this post could be interpreted as saying that women’s bodies in their natural state are unattractive and need to be altered and shaped and controlled to look good. The idea that a well-fitting bra lifts your breasts into their ‘proper’ place is dangerous, because it implies that your breasts are naturally in the wrong place. This is not an anti-bra tirade! I just think it’s important not to reinforce and internalise the overwhelming message that women’s bodies are by nature unpleasant or unacceptable (and that we need to buy things to make ourselves acceptable). To my way of thinking, when Liesl says that a properly fitted bra will get your breasts up into place, she means closer to the way God originally made me: before 6 pregnancies,drastic weight gain and loss, and years of breast-feeding made them sag to new uncharted territory. I’m one of the few women who actually enjoy bra shopping (as long as I can do it without several little people in tow). And it’s due to the fact that I used to be about 50 lbs. heavier, and had no choice but to wear the thickest, most heavy-duty, industrial strength “over-the-shoulder-boulder-holders”. Especially while pregnant and breast-feeding. I would look so longingly at the cute little lacy things, like the ones Liesl posted. But now that I’m a tiny little 34/36 B I can wear the pretty little numbers, although they still need to have some measure of support. I would love to get measured by a professional to ensure that I am wearing the correct size, but there are no boutiques here in my neck of the woods. I know JCPenny’s will do it, but I wonder just how knowledgeable their associates actually are. Brenda, to me that still feels like a negative way to think about our bodies – that at some point it was all correct and since then perfectly normal, natural, and even wonderful things have ‘spoiled’ it (and let’s not forget we all emerged from our mothers’ wombs completely breastless!). I’m not saying that wearing a well-fitting bra is a bad thing, but I do believe that the terms we talk and think about ourselves in directly affect our wellbeing. So to think of a bra as something that helps your clothes to fit well is one thing, but to think of it as something that corrects or disguises our unpleasant natural state is quite another.